Trade negotiations between the European Union, on the one hand, and the United States and Canada, on the other, have raised concerns of European consumers fearing food safety issues. Trade dispute settlements between these countries on food imports to the EU and remedies against the European Communities are other substantial factors governing the bilateral and multilateral trade policies between these countries. 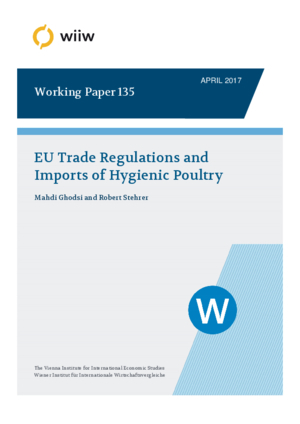 This study sheds light on various aspects of the particular issue of poultry imports to the EU during the period 1996-2014. First, we analyse the mechanisms of EU market protection through the evolution of tariffs and non-tariff measures (NTMs), both descriptively and econometrically. Second, we provide bilateral ad valorem equivalents (AVEs) of NTMs imposed on the imports of poultry to the EU. These AVEs, which are equivalent to tariffs, hint towards the diverse impact of NTMs on various exporters based on their production compatibilities with EU standards. Third, we analyse the quality impact of NTMs, which are also differentiated by the exporting countries. Overall, this detailed study may assist dispute settlement bodies of the World Trade Organisation in analysing cases related to regulatory NTMs for which there is lack of scientific evidence.